There’s a saying that when the student is ready, the teacher appears. That’s kind of how it felt when you made the roasted tomatoes for that cheesy, puff pastry appetizer. I recently found a new pizza dough recipe and was eager to try it, but was hesitating because I’d never been able to make a good, tomato-y sauce. Years ago I attempted it several times and ended up with nothing better than, well, red paste with not much flavor. 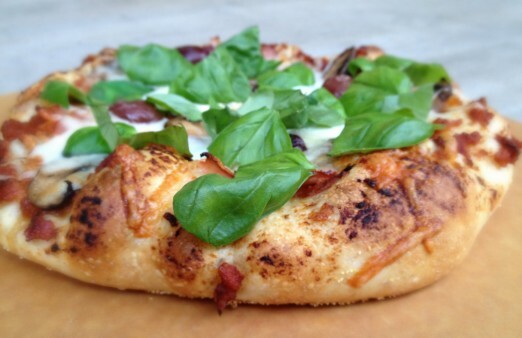 Frustrated, I just gave up on making my own pizza – for good. But that’s crazy, right? I tackle complicated new recipes often enough, and they almost always turn out great. And pizza is supposed to be easy to make. What was it about the sauce that had me defeated before I had even started? The appetizer you made was delicious. (Aside from the roasted tomatoes, when there’s puff pastry and melted cheese involved, what’s not to love?) But it was when I tried one of the sweet, smoky tomatoes straight from your roasting pan that afternoon that I suddenly thought pizza sauce, I just might have found a way to conquer you for good. So there I was a few days later, me and 5 pounds of ripe tomatoes in the kitchen. I tried the same recipe you did and got the sweet-smoky complexity I was after. Yes! But a whole cup of oil seemed like a lot. Tomatoes are pretty juicy anyway, so I ended up with lots of extra liquid that I didn’t want. So the next time around, I used the quicker-cooking variation: I took the seeds and other watery bits from the center of the tomato first, and reduced the oil by more than half. This reduced the roasting time to 2 hours (from 3) but – even better – produced tomatoes with much less liquid and an even more intense, smoky, tomato-y punch. Just what I needed to end my homemade pizza hiatus for good. You can find the Fine Cooking recipe for slow-roasted tomatoes here. This is the adjusting I did to arrive at my really ridiculously good pizza sauce. Heat oven to 350F. Line two 11x17" rimmed baking sheets with foil, then with parchment paper. Cut the tomatoes crosswise. Scoop out the seeds and any pulp in the middle, and then arrange cut side up on the prepared baking sheets. Sprinkle a pinch of salt, then sugar, over each tomato. Arrange a slice of garlic and sprinkle the thyme over the tomatoes. Drizzle a little balsamic vinegar over each tomato, and then drizzle the oil (sparingly, but believe me 1/2 cup is enough!) over the tomatoes and on the bottom of the baking sheets. Roast for 1 more hour, until the tomatoes are browned, shrunken and concentrated. Remove from oven and cool on baking sheets for 30 minutes. In batches, place the tomatoes in a fine mesh strainer over the sink and press out any excess liquid. 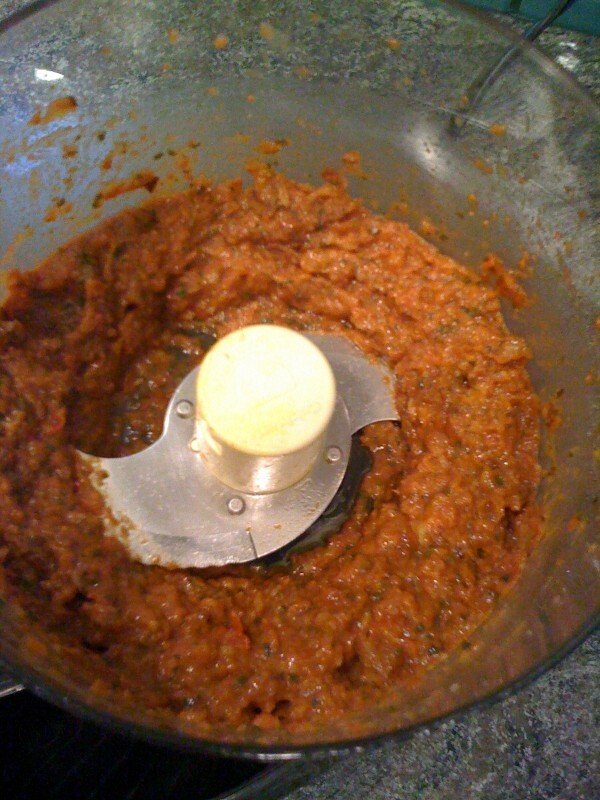 Transfer tomatoes to a food processor and pulse to a sauce-like consistency. Refrigerate for up to a week, or freeze for up to 3 months. I portion out the sauce in small packages before I freeze it, so when I feel a craving for homemade pizza coming on -- which is fairly often these days -- I've got a perfectly-sized amount ready to go. Warm up a few roasted tomatoes and place whole on top of toasted baguette slices with goat cheese spread on them, for some amped-up goat cheese crostini. These are great on their own or as a hearty topping for a main course salad. Slice and toss with shaved parmesan cheese and arugula for a substantial salad accompaniment to grilled meat or fish instead of your regular green veggie side dish. Tuck inside a baguette with cheese and lettuce for an everyday gourmet kind of sandwich. As a twist on the ‘full English’ – instead of a broiled tomato, warm a couple of roasted tomatoes in the oven and serve with eggs and bacon….and the baked beans of course.